FREE HairBow Lesson - Learn How to Make Hair Bows! That's right! You can learn how to make a boutique hair bow with our step-by-step easy to follow instructions. 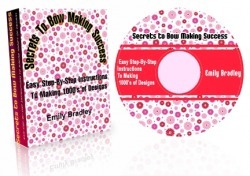 All you have to do is visit http://www.LearnHowToMakeBows.com and we'll email you the link to watch a video on how to make a boutique bow and also the instructions on how to make that same bow (with tons of color photos, step-by-step).